An editorial director who leads two regional dailies and has worked in the industry for more than 40 years is preparing to retire. Martin McNeill has been a regional daily editor for 23 years, editing first the Daily Gazette in Colchester then the Basildon-based Echo, and leading both titles since 2009. He is also editorial director for Newsquest Essex, with overall responsibility for a series of weekly titles including the Essex County Standard, Clacton and Frinton Gazette and the Harwich and Manningtree Standard. Martin has announced that he plans to retire at the start of next year and the search for his replacement has begun. 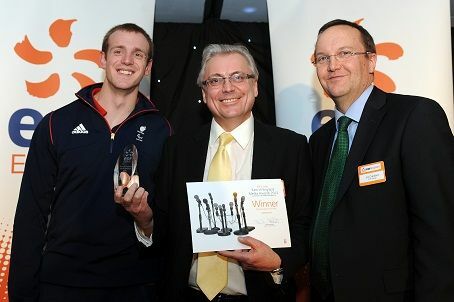 Martin McNeill, centre, receives the award for Daily Newspaper of the Year from Jim Crawford, station director of EDF Energy’s Sizewell B plant, and Paralympics 200m bronze medallist Ben Rushgrove. Pic by James Fletcher. He told HTFP: “I’ve been in local and regional newspapers for more than 40 years and for the last 23 years I have edited daily newspapers. I love the job but feel it’s time to pursue other interests. “We have a fantastic team of people at Newsquest Essex and we have achieved a great deal together. I will really miss working with them. “I’m proud to have played my part in keeping our newspapers strong and vibrant. Before joining newspapers in Essex, Martin worked in various reporting, sub-editing and editing roles in regional newspapers, including as editor of the Petersfield Post and associate editor of The News in Portsmouth. He became editor of the Gazette in 1990 and remained there until 1999, when he was appointed editor of the Echo, which has three daily editions for Southend, Basildon, Castle Point. Martin was then given the dual editorship of both titles in 2009. The Echo is currently East of England Daily Newspaper of the Year, after winning the title at the EDF Energy Media Awards earlier this year. His job is being advertised here. The Echo has really raised its game over the last year or so – no idea if that’s down to MM, or whether it’s something else that’s brought about the improvement. It’s also nice to see a newspaper company lining up a replacement before someone leaves!